A cybersecurity researcher who last month warned of a creative phishing campaign has now shared details of a new but similar attack campaign with The Hacker News that has specifically been designed to target mobile users. Just like the previous campaign, the new phishing attack is also based on the idea that a malicious web page could mimic look and feel of the browser window to trick even the most vigilant users into giving away their login credentials to attackers. 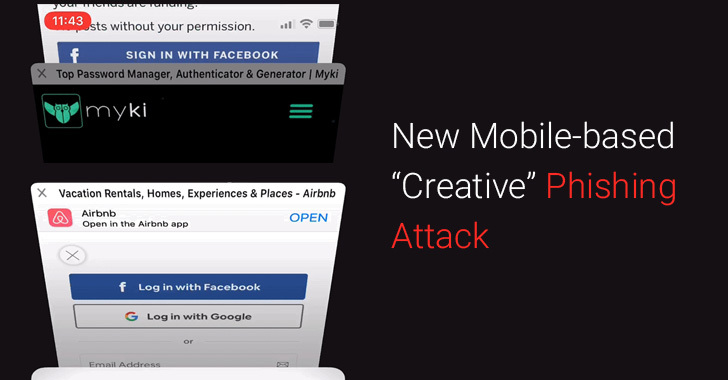 As you can see in the video, a malicious website that looks like Airbnb prompts users to authenticate using Facebook login, but upon clicking, the page displays a fake tab switching animation video aimed to trick users into thinking that their browsers are behaving normally. If users are not very attentive to details and fail to spot minor differences, they would eventually end up filling the username and password fields on the phishing page, resulting in giving away their social media credentials to the attackers. Since there are no clear guidelines to spot such creative phishing attacks, users are highly recommended to 1/ Use password managers that only auto-fill credentials on legit domains, helping you avoid giving away credentials to fake websites. 2/ Enable two-factor authentication, wherever available, preventing hackers from accessing your online accounts even if they somehow manage to steal your credentials. 3/ Ssk themselves "Why am I asked to log in?" Or "Am I not already logged in to this?" The flaw stems from a cross-site request forgery (CSRF) issue in the Wordpress' comment section, one of its core components that comes enabled by default and affects all WordPress installations prior to version 5.1.1. 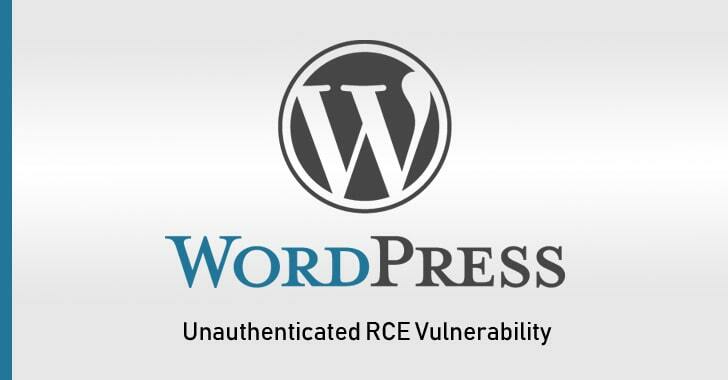 Unlike most of the previous attacks documented against WordPress, this new exploit allows even an "unauthenticated, remote attacker" to compromise and gain remote code execution on the vulnerable WordPress websites. According to the researcher, the attacker can then even take complete control over the target WordPress websites remotely by injecting an XSS payload that can modify the WordPress template directly to include a malicious PHP backdoor—all in a single step without the administrator noticing. Since WordPress automatically installs security updates by default, you should already be running the latest version of the content management software. However, if the automatic updating of your CMS has been turned off, you are advised to temporarily disable comments and log out of your administrator session until the security patch is installed. When playing a video game, most people do not worry about getting infected by the their game client. New research, though, shows that's exactly what is happening when 39% of all existing Counter-Strike 1.6 game servers were trying to infect players through vulnerabilities in the game client. Security researchers have discovered a network of malicious Counter-Strike 1.6 multiplayer servers that exploited remote code execution (RCE) vulnerabilities in users' gaming clients to infect them with a new malware strain named Belonard. The network has been shut down. The person behind the botnet would then use the Belonard malware to make modifications to users' CS1.6 clients and show ads inside users' games. But above all, the trojan was primarily used to promote legitimate CS1.6 multiplayer servers by adding them to the users' available server list, which the Belonard developer would do for a fee. Users can recognize Belonard's proxy servers because of a bug in its code that displayed the server game type as "Counter-Strike 1," "Counter-Strike 2," or ""Counter-Strike 3" instead of the standard "Counter-Strike 1.6." Unfortunately, the only way to prevent this botnet from being created again is to patch the vulnerabilities in the client. As Counter-Strike 1.6 was the last client to be released by Valve, a fix is not expected to be forthcoming. Hubble is a modular, open-source security compliance framework.